My darling mum was always a collector and saver. I inherited and willingly pick up anything she began to discard because of a move to a smaller flat. I fully intend to turn the odds and ends into something, and this shoulder bag is one such thing. I have no clue what she intended the two different kinds of material for. Probably something else. Only thing I’m sure about is the strap surprised her. It’s an old bicycle tube. The top is something shiny, the beads are mostly Czech glass, the floral-print is satin. So here’s the reason I was silent online for a fortnight and a day: I kept myself busy making this little trifle. Which is less of a trifle given the fact that I started out with flat material, a lenght of cord, a needle, thread and two boxes of Czech glass beads. Yup, that’s right: Each and every single one of the beads on this bag is sewn on by hand. I’m rather pleased with the result, I have to admit. I wanted it to look random in it’s pattern, and I followed a meandering trail traced in tailor’s chalk before I began beading. That’s not saying I didn’t beat myself on the head a few times in the process. What was I thinking using the really small beads and tracing such a long trail? And did they really all need two stitches to fasten them securely? The answer is I was thinking how it would end up looking. And I like it. It was worth it. This post is a first for me: A second post in a row on the same piece of craft. It’s just as sideways as last week. But just click back and forth between last week and this to admire the difference! Most of the door, a good deal of the second window. I really am quite pleased with myself. The finished picture is going to a friend, and I’m going to see her in two weeks’ time. I can’t get it done before I see her, because one colour ran out too soon. Most of it can be done though. Since it just lay around idle for a long time, I’ll be happy to hand it over. Yes I know it’s the title of an old movie. From 1960 more precisely, which makes it older than I am. And I never saw it nor the remake from 1986. Sorry it’s on the side. Turn your head, your screen or just think of another movie: When Harry met Sally. She has everything on the side. I’m almost more sorry it doesn’t really show all the shading that means areas of few stitches in each colour. Such areas take forever and usually have me cursing under my breath. Add to this the fact tht I do this embroidery for someone else because I’d never hang anything like that on my wall and I have to ask myself: Why do I do this? Why do I take the time? I actually still like it. I like seeing a pattern and a motif come to life under my fingers. And so I have a feeling it won’t be tha last piece I do. Just the last for a while. Sigh. I seem to dress the family’s duvets in worn-out covers of late with the result that my younger daughter (oddly enough always her) comes to me for another after few nights. Because it rips open. Not so much because it’s older than the others. But because there’s time embedded in it. The blotchy pattern is an experiment I made with thinned-out textile paint dripped and splashed onto fabric. The faint and wavering purple line to the left is embroidered. I spent time making that duvet cover. I spent even more time including some very good time under it. I made it when I moved away from home to a so-called kollegium, a Danish near-equivalent of a dorm except it’s not necessarily on a campus, there’s no room mate system and you don’t have to move home for long vacations. It was there I met my boyfriend / later husband, there I made friends for life ( I hope!) There I battled memory, learning skills, rotten economy, got myself terribly drunk after exams and generally enjoyed life to the most. It was on my bed with this cover friends would sit and share my G&T’s to talk through nights of plans and harebrained schemes. And it’s all associated closely to this cover. We had shared laundry room with washers and a dryer, no place to air-dry anything, and so it would at regular intervals leave its duvet stuffing, go in the washer followed by the dryer to get stuffed again with the duvet. And a dryer does add to the wear of clothes, including bedclothes. Which means the rip is no surprise. The rest is more or less as worn as where the rip appeared. The sensible thing to do would be to just throw it into one of those Red Cross containers. Feelings aren’t sensible. There must be some way to use this. I can’t let it go. Not yet. I’m a scout. 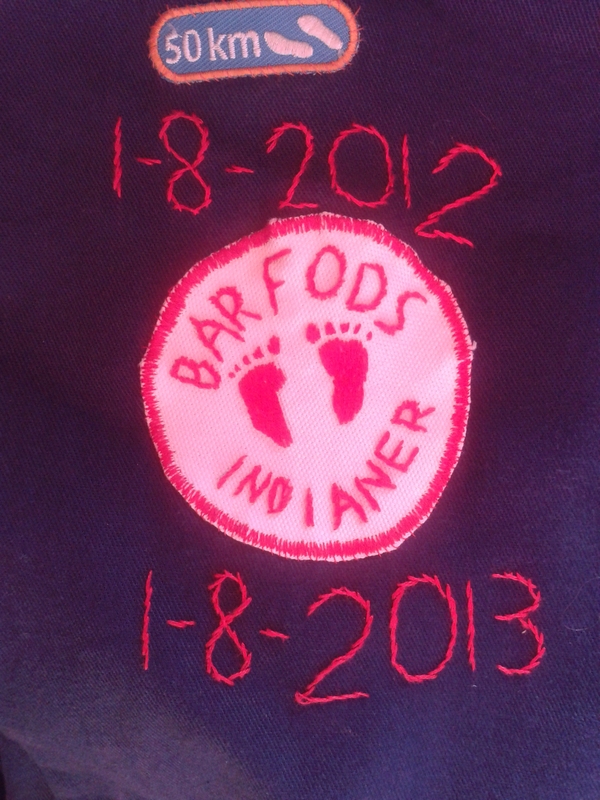 And not only that, I am in the Danish Scout Corps. Though it may sound that way this doesn’t mean there’s only one scout corps in Denmark. There’s the YMCA which also has girls. The old YWCA which has only girls. Tha baptist scouts which are a minority. A parallel to the Boys’ Brigade which aren’t really scouts and whose certain-shade-of-blue uniforms earn them the nickname “the Smurfs”. And then there are us. Non-denominational and gender-mixed. I know from big camps with guests from the world that the uniform is generally taken seriously. Kept clean and pressed, badges only there for one year. We take our uniforms more loose. 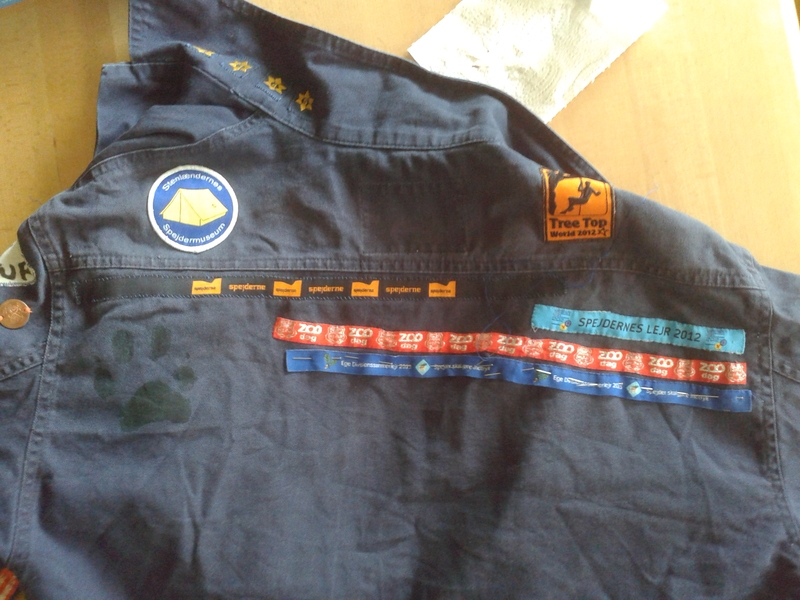 Left sleeve is even worse, filling up with tour and camp badges. This garment represents a LOT of hand-sewing. And the uniforms in general? Just as personal as this one.